Can Baseball season hurry up PLEASE!!! Kristaps Porzingis was walking on his own and described as “OK” as he went to the hospital for an MRI on his left knee, per league sources. This is the HORRIBLE!! Basketball season might just END for me tonight if a certain MRI in the New York area comes back POSITIVE. This is RARE for me to blog about the Knicks on Tuesdays but this is a BOMBSHELL for all Knicks fans around the world. The injury to Kristaps Porzingis is not really clear right now as it happened FEW minutes ago and we are still waiting for the MRI results. I am NOT a medical expert but to me it looks like a SERIOUS injury based on how he reacted following the fall after the dunk. 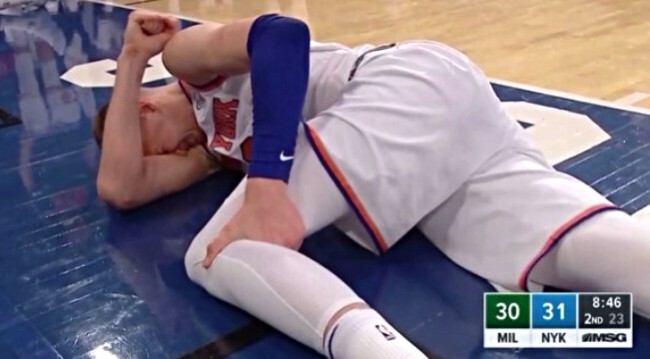 This is NOT the first time that Porzingis has had knee troubles but this is the FIRST time that he has reacted this way. If this injury is SERIOUS than he will probably be OUT for the rest of the season and it will spill over into next season. Based on how the Knicks’ front office were acting after the injury tells me that they knowing SOMETHING we do NOT and it is SERIOUS. Porzingis is the FOUNDATION piece for the Knicks and LOSING him for the season is going to HURT them for the future. It is way too EARLY for us to look at how this injury affects the Knicks in their Trade Deadline plans for Thursday or their plans this offseason. This injury just shows that Porzingis is VERY injury prone and they need a BETTER player around him if they ever want to make the playoffs. I will be releasing a FULL look at the Knicks week as usual Tomorrow, so I will have the UPDATE on the Porzingis injury tomorrow, when we find out more about what exactly is happening with Porzingis. This is the WORST news possible for the Knicks. Porzingis is going to be OUT for a year and that hurts them for the LONG run. The trade deadline on Thursday does not matter anymore, neither does the REST of this season. The big GOAL of the Knicks this season was to DEVELOP Porzingis into an SUPERSTAR and despite him making the All Star Game, this season is a FAILURE for the Knicks. This injury is going to affect the Knicks for at least TWO more years so they are going to be really BAD for a WHILE. Just END this franchise and move it to Seattle. On a LIGHTER note- This is the FOURTH player that has gotten SERIOUSLY injured who was supposed to play on “Team LeBron” for the All Star game, does this mean that EVERYONE on that team is CURSED? I may NEVER watch basketball again after this.